In addition to the opening of Rose Borchovski’s ‘The Arrival’ – which Rowan Derryth wrote about here yesterday – today also sees the launch of a new installation by Fuschia Nightfire – Winter Outlined, which sounds exciting … and rather fun. 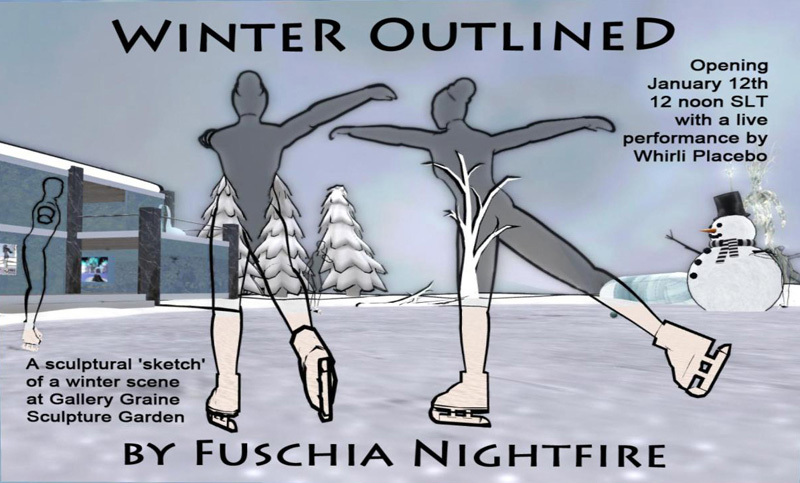 Gallery Graine’s Sculpture Garden is proud to announce the grand opening of Winter Outlined by Fuschia Nightfire, a sculptural ‘sketch’ of a winter scene, with an interesting use of invisible prims. This is an interactive installation, with a free outline avatar that you can wear to skate on the frozen water alongside the sculptured figures. Come and meet Fuschia and skate to the music of Whirli Placebo this Saturday January 12 from 12-2 PM SLT!